Neapolitan painter, called Battistello. 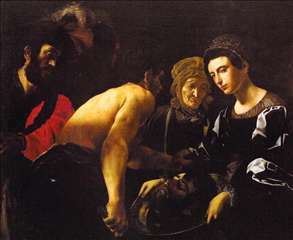 He was one of the greatest Caravaggio s followers, and his powerful work was an important factor in making Naples a stronghold of the Caravaggesque style. He only appe/red on the Neapolitan art scene when he was 30, in the first decade of the seventeenth century when Caravaggio was working in the city. A group of paintings commissioned for Neapolitan churches reveals that he could interpret intelligently Caravaggio s realism. 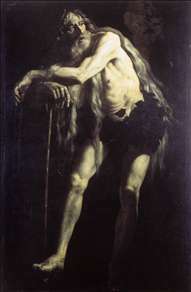 He used strong chiaroscuro backgrounds against which sculpturally defined figures stood out. The decisive impact that Caravaggio made on his style can be seen from his Liberation of St Peter (1608-09), painted for the same church (the Chiesa del Monte della Misericordia, in storage in the Museo Nazionale di Capodimonte, Naples) as the master s Seven Acts of Mercy. 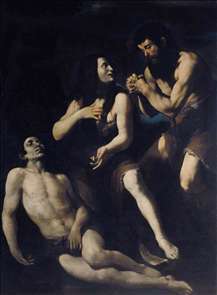 It shows how Caracciolo, unlike so many of the Caravaggisti, looked beyond the obvious trademarks of Caravaggio s style, emulating it in depth of feeling as well as in mastery of dramatic light and shade. His painting became more polished after a trip to Rome in 1614. By then Battistello had become the leader of the Neapolitan school and divided his time between religious subjects (altarpieces and, unusually for a Caravaggist, frescos) and paintings for private patrons. In 1618 he left for Genoa but spent some time in both Rome and Florence in the second decade of the century. During these stays he learnt of the Carraccis revived classicism and met with like-minded painters wishing to reform Caravaggio s legacy. 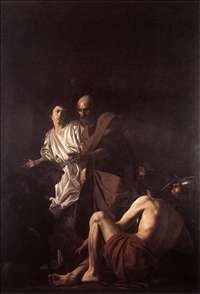 Unusually for a Caravaggesque artist, he was an accomplished fresco painter, and back in Naples, he translated his experience into grandiose, wide-ranging scenes. An example is his masterpiece Washing of the Feet of 1622, painted for the Certosa di San Martino in Naples. The decorations in the Certosa were finished in 1631. See more details about "Lamentation of Adam and Eve on the Dead Abel"
See more details about "Liberation of St Peter"
See more details about "St Onophrius"
See more details about "Salome"